Built around an authentic fishing village, Morro Jable enjoys a stunning setting at the southern tip of Fuerteventura and is ideal for unhurried holidays with plenty of relaxed beach life. Comprising a modern hotel district and picturesque harbour, it boasts two wide sandy beaches – one popular with naturists – divided by a pretty lighthouse-topped headland. Along the seafront, souvenir shops and restaurants provide pleasant pit stops and when you’re not strolling here, the sandy beaches offer calm seas ideal for swimming and sailing. Around the harbour, traditional cafes await and for explorers, the local shores offer hidden beaches and charming little villages to visit. Alternatively, head for the vast sands of Sotavento, roam the magnificent dunes of Jandia National Park or take a trip to Gran Canaria courtesy of the regular ferries from the harbour. XQ El Palacete has an outdoor pool and a sun terrace overlooking Morro Jable Beach in southern Fuerteventura. 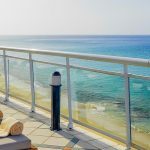 Each room includes satellite TV and a private balcony with sea views. The XQ El Palacete invites you to immerse yourself in the Atlantic paradise of Fuerteventura. It is a unique accommodation option in Playa Jandia, where the customised attention and the small details create the perfect combination for getting rid of stress and routine.